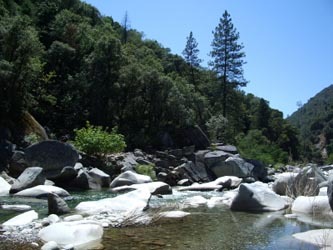 The first eight miles of the North Fork Yuba are nothing but extreme whitewater. On mile two, the narrow class V Moss Canyon takes you down three huge drops in just a mile’s length. Flows increase dramatically at the Downie River convergence on mile six and then Rossasco Ravine pours on the relentless class V for another two miles. Luckily, for the less experience boater, there are class II-III at Goodyears Bar and river access to the class IV run below. Look out for Maytag at mile 16 and portage on either bank if you skipped the first eight miles or if it’s high water. The high-elevation scenery of this run is gorgeous and the canyon has the noted western slope high sierra elements typical of the region, such as granite bedrock and lower montane California Black Oak, Ponderosa Pine, Incense-Cedar and White Fir. While there are not many commercial rafting trips on the Yuba, if you talk to California kayakers, they will usually list it as one of their favorite early springtime runs.